His death only underscores the sad lack of economics knowledge in Washington, however. Many of our elected officials at every level have no understanding of economics whatsoever, yet they wield tremendous power over our economy through taxes, regulations, and countless other costs associated with government. They spend your money with little or no thought given to the economic consequences of their actions. It is indeed a tribute to the American entrepreneurial spirit that we have enjoyed such prosperity over the decades; clearly it is in spite of government policies rather than because of them. The truth is that many politicians and voters essentially believe in a free lunch. They believe in a free lunch because they don't understand basic economics, and therefore assume government can spend us into prosperity. This is the fallacy that pervades American politics today. Our schools teach children virtually nothing about economics and personal finance, which leaves them woefully unprepared for the working world. It also creates whole generations of young Americans who are incredibly vulnerable to the worst pandering politicians. We cannot suspend the laws of economics or the principles of human action any more than we can suspend the laws of physics. Yet this is precisely what Congress attempts to do time and time again, no matter how many times history proves them wrong or economists easily demonstrate the harms caused by a certain policy. The nation would be well-served if Congress spent more time reading the works of Milton Friedman, and less time worrying about petty party spoils. Keith,please consider running for congress next term. This country needs more fact based people like you that are not afraid to speek up! Don't shed too many tears for Uncle Milty. Furthremore, he advocated "targeted inflation" whereby the purchasing power of your oney is slowly destroyed at the rate of about 3% per year. 2. NO fractional reserve lending. None. Nada. Period. Ever. Separate deposit (warehouse banking where the bnak holds your money in safe keeping for a fee) from lending, whereby a bank lends ONLY its own capital OR money that has been borrowed at a LOWER rate than which it is lending AND at a longer duration that which it is lending. 3. No central banking. You don't need a "lender of last resort" creating moral hazards leading to booms and busts if you practice the first two points above. Because government is too power hungry to EVER give up control of a monetray process that benefits them greatly at your expense. Correction: "gonnen" should read "gotten"!!! Milton Friedman was a fraud. A dangerous fraud at that. DOLLAR TANKING TODAY!!! . . .is this the beginning of the long anticipated move out of the dollar -Euro back to 1.31 CHF at 82.5. . .oil up (because no one wants cheap $ for oil) and Gold soaring. . .Uncle Milty would be weeping! Or saying - Told you so. . .housing bubble may be least of USA problems. . .STOP SPENDING Money in Washington!!! Friedman thought the halcyon days for the U.S. economy was the 19th century. Lets see no regulation of employment i.e. kids in coal mines, exploitation of the Irish and Chinese to build railroads. Yeah wonderful times! He was just a shill for the ultra rich which hopefully will be dicredited because of their close association with the neocons, i.e. Mr. "Owners Economy" Grover Norquist. Keith, while I agree with the some of his tenets of smaller government, I disagree that it is always less efficient. Healthcare is provided to the VA and medicaid for less than a tenth of overhead costs that it consumes with private insurers. If you want to learn more of what he advocated spend a half hour here. This is the top in Gold. Sell! Sell! gold - too the moon (and back). That's why the constitution requires gold and silver as money because you cannot simply print money when you need it. Of course the constitution has been ignored on this point. The Founders knew the fundamental medium of exchange, if manipulated, was a sure way to destroy the country. It's your constitution. Stop voting for politicians who won't follow it. The countries with the smallest governments are also the most uncivilized, brutal and backwards. Milton Friedman was the architect of the banana republic. If anything, Greespan and others were his greatest disciples. The truth, which no one seems to acknowledge, is that the 90s, the so-called great age of free market capitalism, was actually the dearth of American R&D which is why today, there are no new industries sans the RE bubble. The 90s IT darlings, Oracle/Cisco, etc, were based a lot upon mature technologies based upon true research at DEC/Xerox/Natl Labs during the 60s/70s. So you see, Uncle Miltie's system only reaches for the lowest hanging fruit and once those fruits were picked, the rest of our industries move abroad to Asia-Pacific which then enabled them to develop into 1st world industrial states. Thanks a lot Milton, because you and your disciples have engineered the fall of the American century. I hope you're proud of yourself. Mises is the true libertarian economist. I'm a 38 year old physicist (Ivy and major research university education, lots of papers), and I've been unemployed for 8 months. Don't forget wireless communications, including spread spectrum etc---all of that technology and theory comes from the 1960's military and space programs. Corporate R&D in non-biological engineering has been cut to the bone in the USA. Either it's very short term startups or being sent to China & India. There is some innovation in biotech, but unfortunately, that ends up as consumption, not production---because it is is paid by the out of control health care spending. It is cruel but true: drugs for grandma are not at all as profitable for the long term economy has hard-physics and hard-engineering things like microelectronics. "Don't forget wireless communications, including spread spectrum etc---all of that technology and theory comes from the 1960's military and space programs." I'm anon 7:05:55 PM and I've been wary of the Friedman disciples for the past fifteen or so years. The fact that people engage in market enterprises isn't something that one needs a PhD or a Nobel Prize in economics to tell the public, it's simply commonsense. Markets, exchanges, etc have been there since the times of the ancient Egyptians; this is natural whether or not there's a govt around. People buy and exchange goods and services, this is not newsworthy. A modern industrial nation's core R&D, however, is not an equity, pork belly, OTC swap, or derivative instrument but an initiative for the nation, as a whole, which short-term markets don't take into account, that'll insure a nation's mastery of the scientific arenas which'll lead to future industries and long-term national competitivity. The way this works is that a nat'l lab invents a way of doing something, that something then gets into the public sector, and then companies capitalize on it by developing commercial applications around it which then has patent portfolios on different aspects of the applications. When this technology matures, factories then move to Mexico and China to take advantage of the low end labour arbitrage, and then the companies pick up the next wave of R&D from the nat'l labs for the next generation of products/services and the cycle repeats. The end result... jobs for Americans and long term stability of American industries. When the first part of the above equation is sliced out, all that the private sector does is recycle existing product lines and then moves everything (including development) offsource and then turns a product company into a financial company via vendor financing and moving their "cash" into hedge fund activities since there are no new apps coming from the public sector R&D. The end result... the gutting of American R&D and the ascendence of Asia-Pacific as the new center for the world's scientific endeavors along with the transfer of a century's wealth out of America. Thank you Uncle Miltie. Keith, I'm afraid your support of Milton Friedman, as some kind of superhero visionary has really shown me that you're really no more intelligent than the Fox viewers you rail against continually. You tend to jump on sensationalistic stories w/o any real insights other than the ones provide by one establishment group or another. Too bad because for a while there, I thought that you might have been an original thinker or an observant individual but you're just like everyone else. Keith, perhaps you need to look at the real Milton Friedman, a bit closer. Do you really want a person like him setting policy? "Company insiders with knowledge of bad behavior should be encouraged to profit from their information, Milton Friedman said in an interview on CNBC's Power Lunch. Milton Friedman, a Nobel laureate in economics, is a senior research fellow at the Hoover Institution and co-author, with his wife Rose, of "Two Lucky People: Memoirs." He recently sat down with CNBC's Michelle Caruso-Cabrera for a wide-ranging interview. Below is an edited version of their discussion of corporate scandals. Michelle Caruso-Cabrera: Many Americans feel jilted by the market. They feel that when you look at the situation with Enron (ENRNQ, news, msgs) and WorldCom (WCOEQ, news, msgs), they were ripped off. Milton Friedman: Well, they were. Caruso-Cabrera: What do you think was the cause of all these scandals? Friedman: I think we should ask the question of how they were discovered. How did we find out about Enron? Caruso-Cabrera: Somebody blew the whistle. market is a very effective mechanism for uncovering cases like that. In fact, if I may say something thats very heretical, one of the reasons we've gotten things like Enron is because we've been increasingly outlawing insider trading, but insider (trading) is the most effective means of making sure a company that does the wrong thing is penalized for doing so. Caruso-Cabrera:: What do you mean? price of the stock. And that alerts other people. incentive to make the public aware of that. Caruso-Cabrera: By selling and hence driving down the stock price. Friedman: Or by buying when its the other way around. attention. Is that a good thing or a bad thing? to the stage it is. Caruso-Cabrera: So it shouldn't be a requirement that they have to publicize that they've sold stock? Friedman: I think not. It never used to be, you know, this is not a matter of the last 20 or 30 years. Caruso-Cabrera: So you're saying it would be the volume of selling, not who is selling, that would drive the stock price lower and hence signal to other people. got to encourage them, the price has to go down. market which are really the consequences of government interference with the free market. of their activities in general." Keith, good work there on censoring the Pinochet-Friedman essay, "Milton Friedman and the Economics of Empire". I'm getting less and less impressed by you by the week. 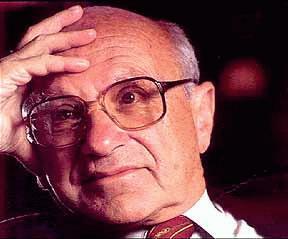 Milton Friedman wants more insider trading, what a great man to have running the financial system. Next! thanks for fixing your mistake. Hope you learned how to blog. friedman simply says the market will take care of things. nothing is more efficient than the market. And you'll all get a nice demonstration of this as the housing collapse destroys the american economy, as it should. The way the market self-patrols is by whacking people on the head when they get stupid. Since we've never been this stupid before, I expect Mr. Market to give us one sound whack on the head that we'll remember for generations to come. I love your blog but couldn't disagree more. Let the market rule and you can get extremes... corrections, communism, fascism and all kinds of nasty stuff! What we've gone through in this bubble is not pure free market capitalism. We are living in a heavily regulated inefficient market. For example, how could a near bankrupt company such as KMart come out of protection and buy up Sears? In a true capitalist world, wouldn't it have been the other way around? We don't know what happens in a true free market driven world because we've never known it. Intuitively, I believe that a true free market economy would soon be taken over by some power hungry crackpot. "Intuitively, I believe that a true free market economy would soon be taken over by some power hungry crackpot." And market adherents like Friedman, who're really shills for the monied powers, have enabled it with the lack of public oversight and glossing over the ability of those, who can buy access to make the rules as they go along. I can't believe Keith would support a shill who believes in insider trading. If anything, fascism-like systems grow because so-called intellectuals (Keith included) love to give up their own analysis to others with titles and nobel prizes behind them. Keith supports ANY drama for his HP Blog's sake, imo. "Not that there is any thing wrong with that."